This book was a surprisingly good read. I've read other books on D-Day in the past, so I was afraid that I would have "reading fatigue" with this one. However, that was not the case. This particular work is story-driven, focusing on individual servicemen and civilians whose lives would become forever linked to this world-changing event. The writing in the book is excellent, it's definitely accessible to casual readers, but there is enough information to draw in the most knowledgable buffs. 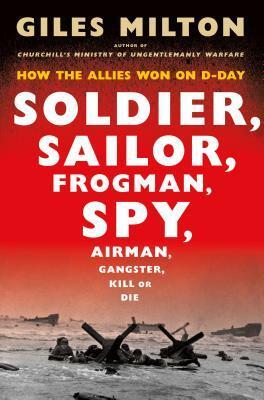 A very detailed account of the D-Day landing focusing on one soldier, civilian or other person at a time. Excellent at picturing that but cannot, of course, deal with the overall strategy of the allies or the Germans and how this affected the course of the war. The author takes the events surrounding D-Day, the massive attack that turned the tide of World War II, and recounts them from the perspectives of those that were there, both on the Allied side as well as on the Germans’. Though the narrative flows My attention was riveted on the title. Frogmen! Spies! Thanks go to Net Galley and Henry Holt for the galley, which I expected to love. Though I am disappointed, I would have been more so had I paid the cover price for this fast-and-loose pop history. Giles Milton - British writer and journalist Giles Milton was born in Buckinghamshire in 1966. He has contributed articles for most of the British national newspapers as well as many foreign publications, and specializes in the history of travel and exploration. In the course of his researches, he has traveled extensively in Europe, the Middle East, Japan and the Far East, and the Americas. Knowledgeable, insatiably curious and entertaining, Milton locates history's most fascinatingand most overlookedstories and brings them to life in his books. He lives in London, where he is a member of the Hakluyt Society, which is dedicated to reprinting the works of explorers and adventurers in scholarly editions, some of which he uses in his research. He wrote most of Samurai William in the London Library, where he loves the "huge reading room, large Victorian desks and creaking armchairs". At home and while traveling, he is ever on the lookout for new untold stories. Apparently he began researching the life of Sir John Mandeville for his book The Riddle and the Knight after Mandevilles book Travels "literally fell off the shelf of a Paris bookstore" in which he was browsing.